Many people have no idea that chimneys should be swept. In case you have not heard the term chimney sweeping, it means to have your chimney cleaned to remove debris and other materials. If the chimney is not cleaned regularly, creosote can build up over months and years to become a rather serious issue. Creosote is a tacky and smelly substance that is created during the normal operation of your chimney. Over time, creosote can very well lead to a fire. In fact, based on some estimates, creosote is the culprit for one in four house fires. So, your chimney should be swept regularly, but who should do it? You are certainly capable of cleaning your own chimney. There are a few risks if you plan to clean the chimney yourself, such as falling off a roof, scattering dust and creosote throughout your house, etc. A chimney sweep company is usually not very expensive and could be very educational if you find the right one. You will also need to purchase or borrow some tools to get the job done correctly. First, you should put some plastic or some kind of barrier to protect the floor around your fireplace. Tape some thick plastic sheeting over the fireplace to prevent debris from coming into the room. If you do not seal the fireplace completely with plastic, you could easily have some neighboring rooms and furniture with a light dust coating. At this point, it probably makes sense to start thinking about how to protect yourself. Putting on goggles and a dust mask before continuing is a great idea. Move on to cleaning the firebox by removing remaining wood and ash. 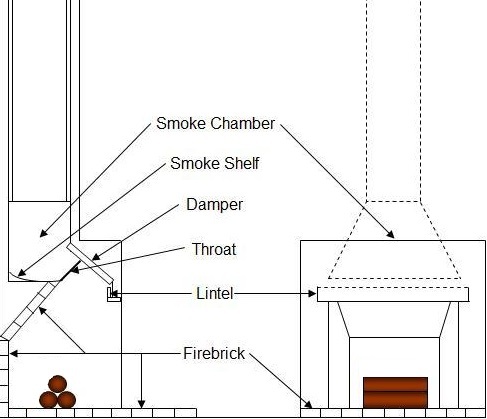 Open the damper, if you have one, so you can access the chimney from the roof. Now, it is time to pull out the ladder and get on the roof. Another warning should be given that doing anything on a roof is more risky than many other DIY tasks. While your roof and chimney might not seem that high, falls happen more often than you think. Remove the hardware, such as an animal guard, from the top of the chimney if there is any. Once the chimney hardware is removed, use the largest brush, in terms of diameter, to begin sweeping from the top down to the smoke shelf. This area is flat and located behind the damper just as show in the picture. Reattach the chimney hardware that you removed making sure that it is secure so that it does not come off during heavy winds. Climb down the ladder and head back inside your house. After waiting for 30 minutes, the dust that was scattered while you were sweeping the flue will have settled. Make sure that all windows and doors to the outside are closed and will not be opened during this last step or you could have a lot of dusting to do around the house. Remove a small portion of the plastic that was taped over the firebox so that you can put a chimney brush in. Use the smallest diameter chimney brush you have to sweep up into the chimney as far as possible. When you are done sweeping, reattach the small portion of taped plastic you removed before sweeping, which should allow the unsettled dust to fall to the bottom of the firebox. After waiting for some time, you can now carefully remove the taped plastic from the fireplace. Once removed, you can start to vacuum up the rest of the debris and dust in the firebox. After following all of the above steps, you should have successfully cleaned your chimney. Remember to sweep your chimney regularly and to have the chimney inspected every few years by a professional.